The manufacturing and construction industries require a substantial amount of funding for human labor and building materials, as pointed out by Regis Geisler of Lincoln Electric. Traditional welding methods take up 69–85% of the total cost of labor and building materials, however, less time-consuming and high-deposition rate welding techniques—such as GMAW—may reduce total overhead costs by as much as 25%. 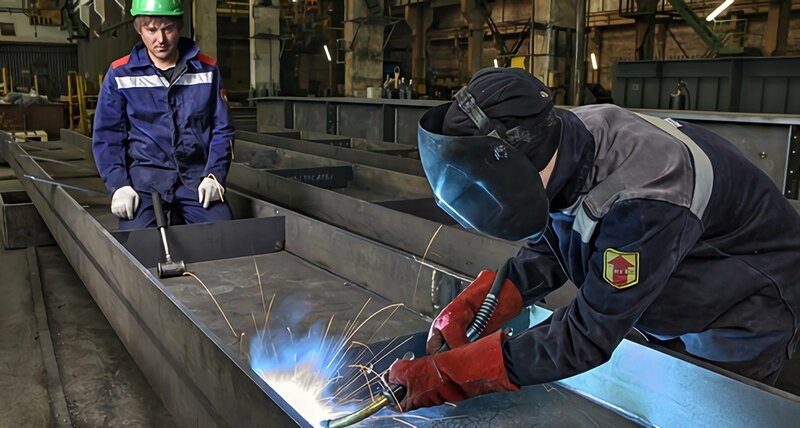 As GMAW is a common welding method, those enrolled in a welding program ought to know the fundamental characteristics of this welding technique. Below, you will find more information regarding the definition, tools, applications and advantages of GMAW welding. 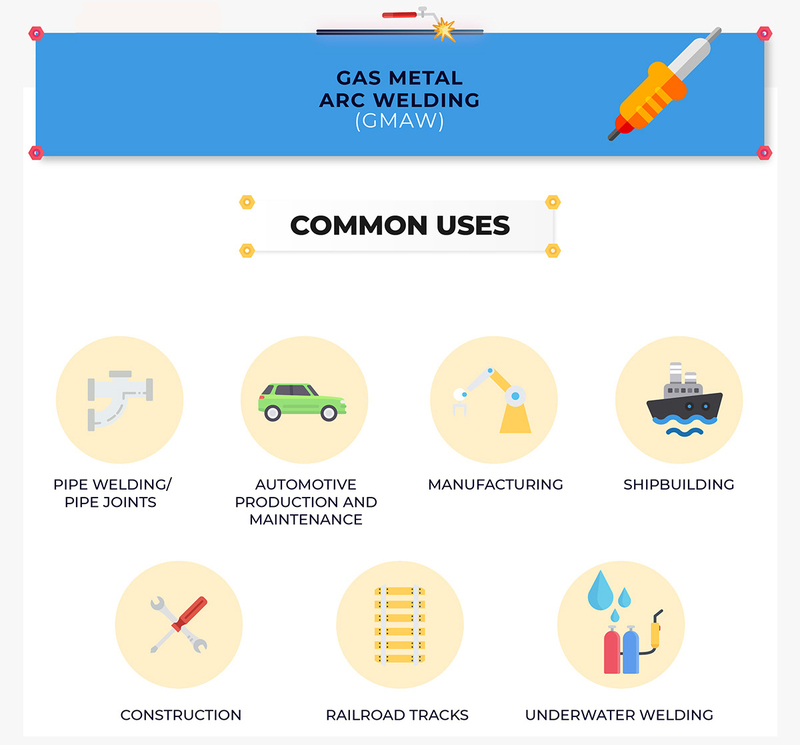 GMAW (gas metal arc welding), which is also referred to as MIG (metal inert gas) welding, is a technique that enables welders to perform a weld on traditionally non-ferrous materials. 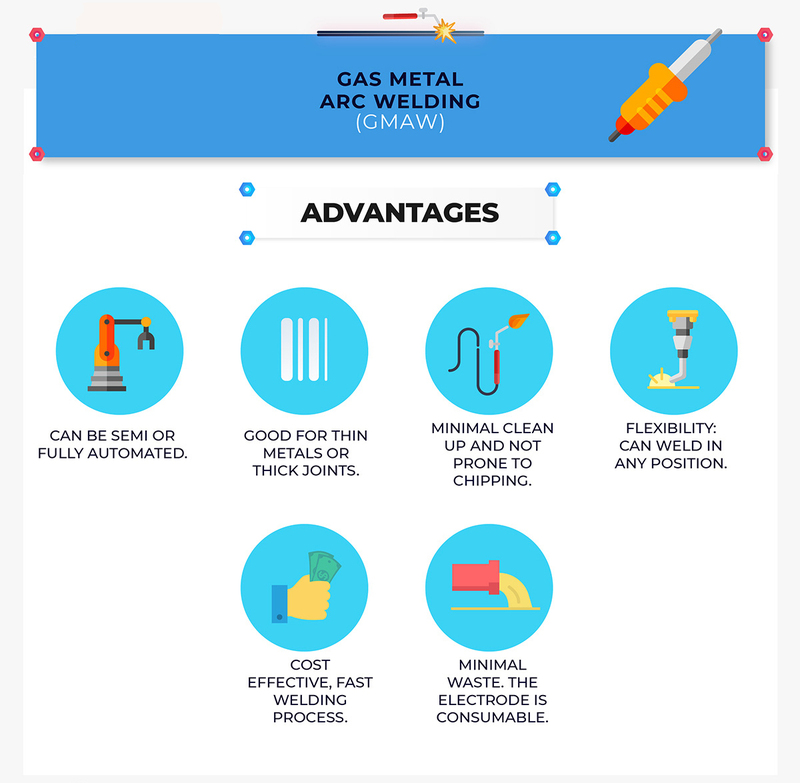 This method is called gas metal arc welding due to how the weld forms: a continuous wire electrode is fed through the welding gun to the site of the weld, while a separate tank of inert gas provides a shield around the site of the weld. The gas prevents external influences from weakening the integrity of the weld during and after the welding process. Depending on the technique used—semiautomatic, machine or automatic—you may need a hand-held, machine-controlled or robotic welding gun. Automatic welding usually does not involve any human labor, aside from determining when to begin. The basic equipment for a typical GMAW semiautomatic setup includes a welding power source, wire feeders that ensure constant speed and voltage, a supply of electrode wire, a welding gun and a shielding gas cylinder. Although GMAW was originally created for welding aluminum and other non-ferrous materials, it is now used for steels, as it requires less time than other welding methods. Since GMAW can be used for a variety of metals, this welding technique can be applied in any industry where these materials are employed. Below, you find some of GMAW’s most common applications. The automotive industry uses GMAW for both production and maintenance. Robotic assembly lines use GMAW for time-efficient manufacturing processes. Pipefitters use GMAW during the welding of pipe joints. The rail industry uses GMAW for fast, durable repairs or construction of railroad track. GMAW is not prone to chipping. GMAW may be used on very thin materials without burning holes. Less hydrogen is held within the weld, which promotes the integrity and strength of the bond. GMAW reduces the wasting of electrodes as all of the material is placed within the weld. GMAW’s continuous electrode reduces the amount of time spent by welders changing out electrodes. The same electrode material may be used to weld thick or thin materials. As the number of manufacturing and construction jobs 1 increases, the demand for welders will likely also continue to grow. Furthermore, the range of applications and advantages of GMAW welding make this welding technique a necessity for anyone considering entering the field of welding. If you’d like to learn more about entering the field of welding, contact Tulsa Welding School today.